We use Solver's BI360® Software, MIcrosoft's PowerBI® and the Microsoft SQL Server Platform to enable the full BI365® Framework. 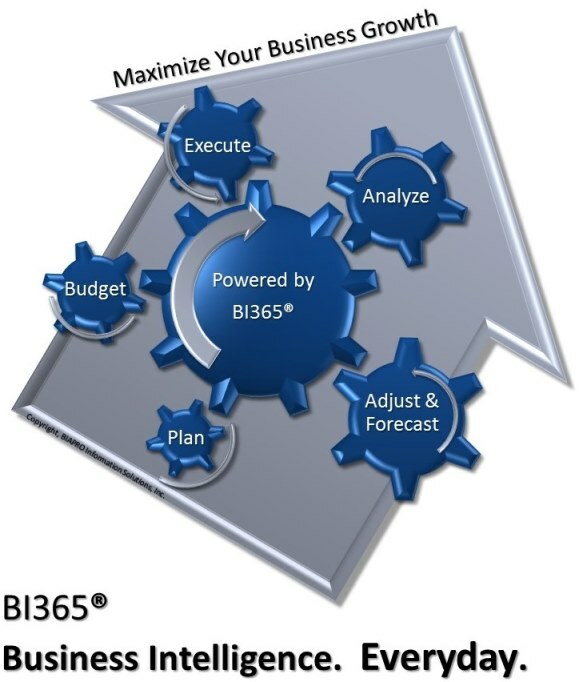 BI365® refers to the overall framework that BIAPRO® will design and fully-implement at your organization to integrate Powerful Analytics that will enable all your key management functions, which may include planning, budgeting, variance/trend analysis and forecasting. As Management Consultants we understand Business. As Analytics Experts, we understand how the power of technology can amplify your organization's strengths and eliminate its weaknesses. It is necessary to enable Business Intelligence across your organization with the right mix of Management Practices and Analytics. High Quality Information should be easily and quickly available, making it a regular habit to analyze and understand the latest business performance. An easy-to-use Budgeting and Forecasting platform should facilitate the vision & collaboration necessary to reach the highest potential for your Company's future. BI365® Analytics Framework will transform your business. Easier. Better. Faster. BI365® is about integrating Management & Analytics to make all these tasks easier, better and faster for everyday use, so you can focus on what really matters... Growing your Business! At BIAPRO® we have developed a flexible technology platform that is cost-effective and uses open standards. You probably already have all the required software to start reaping the benefits of BI365® right now. Why wait? Contact us and request a Business Intelligence Analytics (BIA) Diagnostic to get the ball rolling. Go ahead, discover more about BI365® from our Overview or contact us to learn more. PIVOT365™ Analytics will transform your business. Analytics. Everyday. If you have Data locked up in Transactional Systems we can show you how to start gaining real-time insight into your business, quickly and easily. Pivot365™ fits within the wider scope of BI365® by enabling the powerful analytics required to carry out "Trend & Budget Variance Analysis". Pivot365™ is the most important step towards implementing BI concepts and processes in your organization that will enable quick and easy access to all of the information currently locked away in your transactional systems. Pivot365™ can make use of a wide range of technologies that work together or within your existing IT infrastructure. From the basic Pivot Tables based on manual extraction from transactional systems to the more automated and advanced technologies of OLAP Cubes, Pivot365™ will define the perfect Road Map within your organization to start gaining insight and maximizing the growth of your business.